At first glance, Anila Quayyum Agha’s All the Flowers Are for Me (Red) is easy to describe: a five-foot red steel cube, illuminated from within and suspended from the ceiling, its six faces covered in intricate floral and geometric patterns. However, the cube is only one aspect of the work on display, as the shadows the light creates are part of the experience. These shadows create an immersive environment where your experience of viewing the work is also participatory. As you move through the space and around the cube, the patterns cast by light ripple and change, making you as much a part of the art as the object in the center of the room. 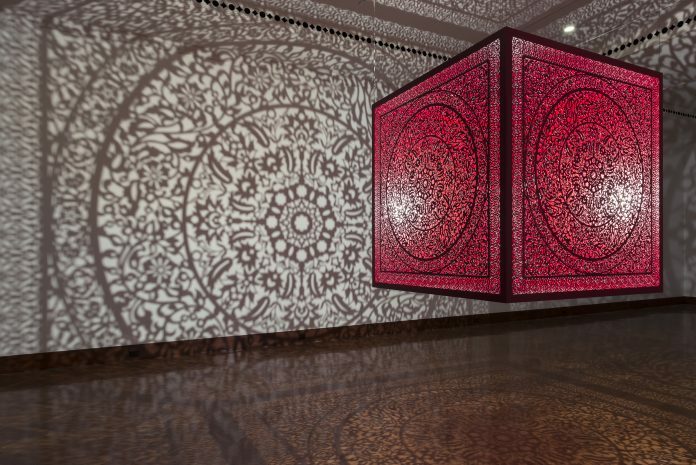 The ability to be a part of the exhibit is one of the most moving elements of Agha’s work, currently on display in the Cincinnati Art Museum. 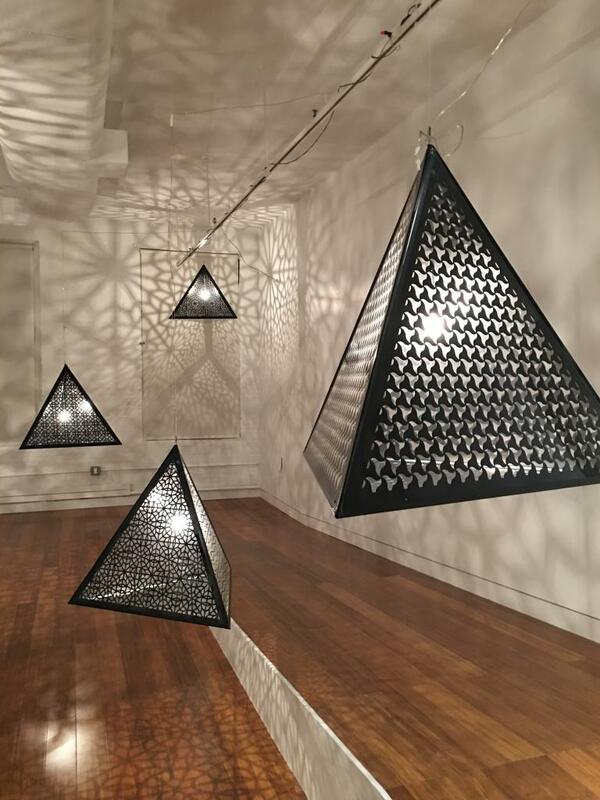 Agha, a Pakistani artist who came to the US for graduate school, sought to create a welcoming space with her work. The space is a refuge, referencing her experience as a migrant often feeling isolated. All the Flowers Are for Me (Red) is a welcoming space that is subtly changed by your very presence. In addition to the cube itself, you can also see eight large-scale drawings created by Agha, a mixed media artist who creates series of works on paper exploring pattern. If you’d like to see other exhibits in the museum that explore similar themes, there are several different ways you can do so. To get a feel for the Islamic floral and geometric forms that have influenced the piece, you can see the Damascus room or the tile mihrab. If you’d like to check out another contemporary artist working with light and space, visit William Kentridge’s More Sweetly Play the Dance. Followers of Agha’s work will get a special treat if they attend BLINK: During the festival, another of Agha’s pieces will be on display at the Cincinnati Shakespeare Company’s new Otto M. Budig Theater.